Mountain to Mountain’s 2008 goal has been to support the dZi Foundation’s, Revitalize a Village Project in Gudel, Nepal. This project model is changing the lives of thousands of people in some of the most remote Himalayan villages. The program places control of development projects in the hands of the community from the very beginning, mobilizing leaders and education local villagers to support projects that are sustainable and serve within the existing social framework. 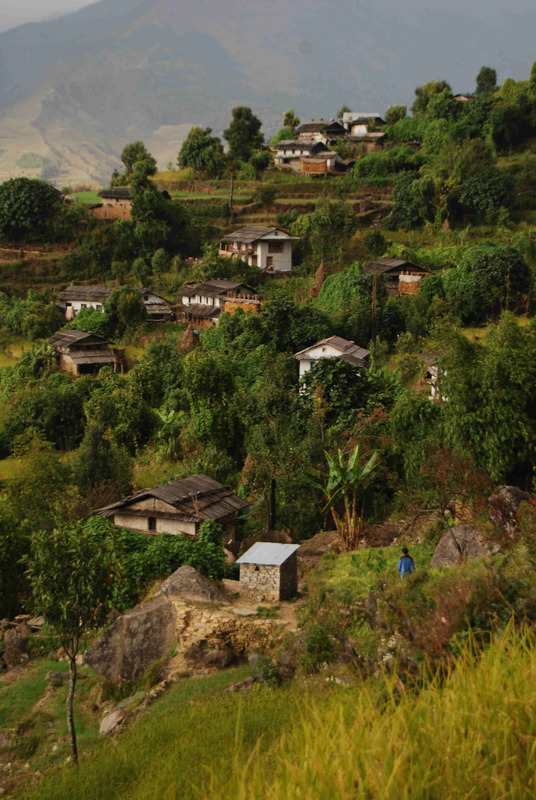 Gudel is located in eastern Nepal and this community is one of the poorest areas in Nepal, and the poorest in the world. Photographs that they have acquired over the years and keep in dusty journals and show to EVERYONE. They spend hours poring over them. We just had a fantastic field visit to the community, and I am very happy with the motivation of the local community members there. We have just completed the formation and training of 7 Parent Teacher Associations – one in each local school. Each school received a 2 day training and, while PTAs may not be a terribly dramatic program by our western standards, this initiative has already had a great impact upon the management of schools and the local investment in education. We have also begun to survey and design a new drinking water project that will bring clean water to 80 households (about 400 people). This is a fairly significant undertaking as the water will need to be piped in from 3 kilometers away. The construction process for the new school building in Namlung has begun with the quarrying of rocks and site preparation. We have also secured funding for a large toilet construction program in Gudel. Our goal is to ensure that there are hygienic toilets in each home and at each school in Gudel – about 600 toilets total. This program is essential, as our baseline data shows a fairly high incidence of what seem to be tapeworm-caused illness and even death that is a direct result of using pig pens as common toilets. To Go or Not to Go…THAT is the question. Two weeks have passed since the news of the IRC aid workers being attacked outside of Kabul. Since then, there have been two more attacks on aid workers, and the news that the US has killed 76 civilians, mostly children in a bombing. I have been making plans to go to Kabul with a photographer and friend, Tony Di Zinno this October. One of the main purposes of going is to meet with several Afghan NGO’s to learn firsthand what is needed for the women and children of this war torn country. There is an amazing and diverse array of NGO’s – those on the ground talk of the lack of control over the mushrooming of organizations and individuals tripping over themselves wanting to help. We need to have discussions with these organizations and work to find the projects that are most needed and can be accomplished in their current political climate. One of our meetings is with author, humanitarian, and adventurist, Rory Stewart. His organization, Turquoise Mountain is dedicated to rebuilding and preserving the historical and cultural fabric of Afghanistan. Their work ensures that the Afghan culture and traditional art is not lost entirely through the decades of war and occupation. They have offered help in finding a location in Kabul to host the ‘Views of Afghanistan’ exhibit. Another meeting is with CU Boulder professor, Wahid Omar and his wife Soraya Omar. Both are Afghan and are living in Kabul. We will be staying at their guesthouse while in Kabul and meeting with them regarding their NGO, Afghans 4 Tomorrow. Additionally, while we are in Kabul, we are hoping to develop our photography exhibit for 2009. ‘Views of Afghanistan’ unites Western and Afghan photojournalists in a collaborative show to show the many faces of this war torn country, beyond the war and burquas. I am looking forward to meeting many of the Afghan photographers we are including in this show who are based in Kabul. We are pursuing the possibility of a student photography project with a group of boys and girls. Our goal is to take 20 cameras over and work to create a project with a local photojournalist that shows Kabul from the eyes of the youth culture while empowering these children to tell their stories from their own perspective through a new medium. Some of these photographs would be included in the upcoming exhibit. While typically the biggest obstacle is the money involved to make a trip like this, in this case, its safety. As numerous friends forward me New York Times articles highlighting the increase in violence within the country, the question to go is heavily pondered and increasingly dissected. What is the risk, and what is the benefit of going? I have a young daughter and that weighs heavily on my decision. While I don’t put my life in great risk often, my risk/benefit ratio was different pre-Devon than post. Yet, for the moment, all systems are go. We are operating as if we will make this trip (funding is still at issue) with the knowledge that things may ‘blow up’ – pardon the pun – and we’ll have reschedule. Yet, the gut instinct is to go there, find the stories, make the pictures, and meet the people of this incredible country. As Buddha once said, “Your goal in life is to find your work, and give your whole heart to it.” And so we go to find that work, and inspire those who support Mountain to Mountain to help us affect positive change in the hearts and minds of these resilient people.